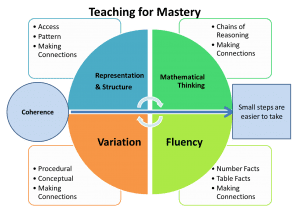 Why Teach using a Mastery Approach in Mathematics? Teaching for mastery is a Department of Education initiative which started in 2016. The purpose of the initiative is to develop Mathematics teaching and learning in England. The aim is that all schools in England will eventually be teaching using this methodology. At a Primary level that schools who are teaching for mastery have had improved SATSs results compared to those who are not and in Secondary schools we are seeing results which indicate that our slower learners are keeping up with the middle of the cohort more and the whole cohort is achieving higher results. Learning is broken down into small learning aims steps. Explicitly connecting new ideas to concepts that have already been understood. Very carefully planning the order of learning to facilitate this. Students work on ideas to develop deep understanding rather than passively receiving them. Students should be able to reason and discuss. This includes using mathematical terminology and notation as soon as it is relevant. Quick and efficient recall of facts and the ability to use them in different contexts in Mathematics. Varying the way a concept is presented to a student and varying practise questions so that mechanical repetition is avoided. Include the use of different methods and misconceptions. Concrete, Pictorial and Abstract. Representations expose students to the mathematical structure so they truly understand why mathematical algorithms work and can therefore adapt to different scenarios.